My card is still celebrating Christmas and some of you may have received this card! I think you can see the gold stars are what I picked out from the photo. Check back later and I will show you how I made a few tiny changes to this design to add dimension-I am Guest Designing at Less is More in a few hours and would love you to check this out. Love seeing the two takes on this design. Perfect for the inspiration photo. What a lovely card! I feel honored that I am able to see it in person. =) Just as lovely! I like the bold star and the festive sentiment. Happy new years! What a fabulous design this is and so perfectly stamped. Oh well, Sandie, you KNOW that this card has a VERY special place in my heart, and on my shelf too, as it turns out! ;-) It really is simply stunning! I ADORE how dramatic you made that star with its gold spritz against a bold black sentiment. It is truly superb and CAS-tastic! Thanks so much for sharing with us at CASology this week and a VERY happy New Year to you! It looks gorgeous with the gold dots/splatter to create the shape of a star. Fab idea! This is gorgeous. I love how you did that star. Truly beautiful.Thanks so much for playing along at CASology. That gold star just screams celebrate! Thanks for joining us at CASology this week, Sandie! 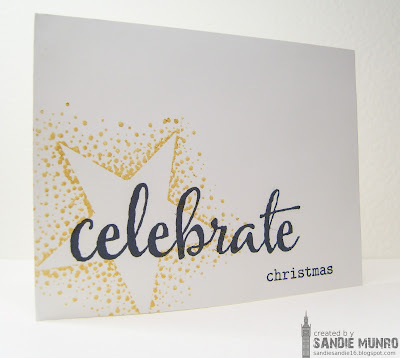 Gorgeous CAS card (and I should know as it is sitting on a table in my house with all my lovely Christmas Cards!)! Thanks for joining us at CASology this week! 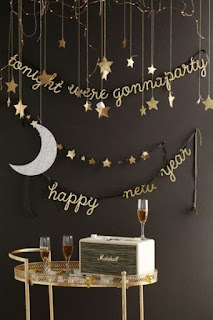 Your 'shooting star' in celebration of the New Year is gorgeous! And speaking of gorgeous: thank you soooooo much for both the birthday and Christmas cards! Treasured immensely - as I treasure YOU! Hugs and love! I recognize this one:) perfectly CAS and balanced, even prettier irl. Love the variation of it for dimension in the LIM post too.